I began purchasing garden seeds this February. 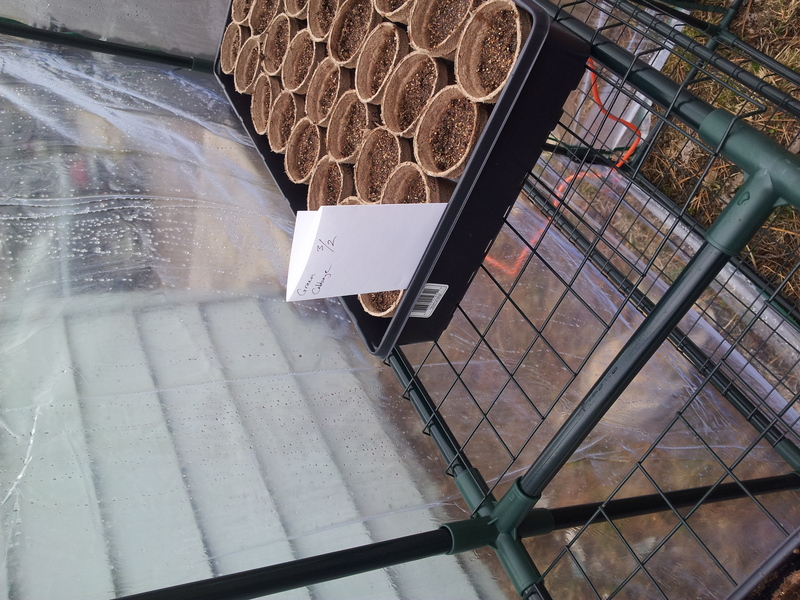 Some of the veggies I’ve chosen will take a long time to be productive, so I want to get a jump on the growing season. I have a problem though. I don’t have power on my property (yet) or consistent water. I also don’t have a greenhouse. Assembly wasn’t a big deal. The poles are metal and use plastic connectors. It’s a lot like tinker toys. The zippers aren’t the best but the price was great. The zippers didn’t work well the first day, but I think the outside plastic needed to stretch and settle. There are no problems with the door now. The days have been above freezing, with the nights dipping into the high 20s. I’ve installed a shop light to provide some heat at night. 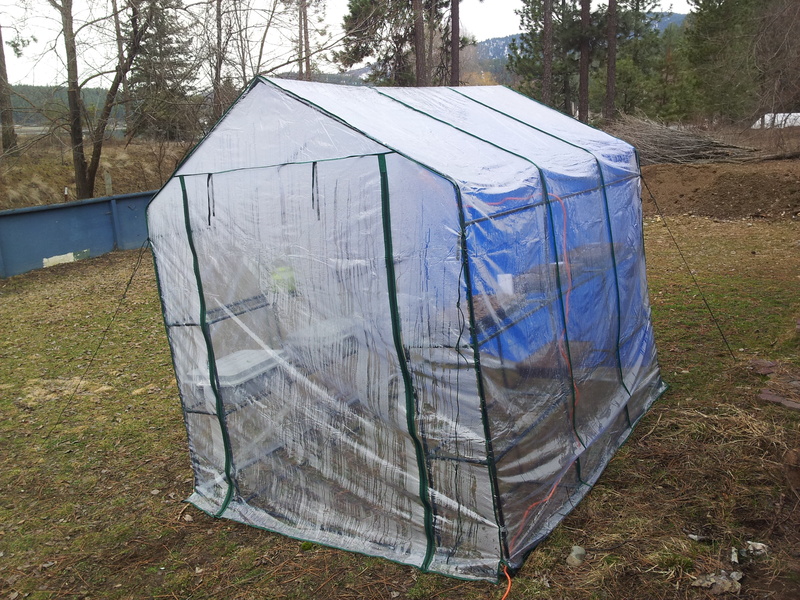 Since the radiant heat can escape through the plastic, I’ve put up a tarp. The tarp is on the west side of the greenhouse. I normally wouldn’t cover that side, but the west side is shaded anyway. The north side (right side of pic) faces the house and catches a little heat from the wall of the house. The ground isn’t level. That’s been an issue. the greenhouse sags and the lines don’t stay taut. If I tighten the lines, the stakes come out. The green house really needs level ground, but I don’t have any to offer right now. This means I’ve had to raise the downhill side with bricks. It’s not ideal. 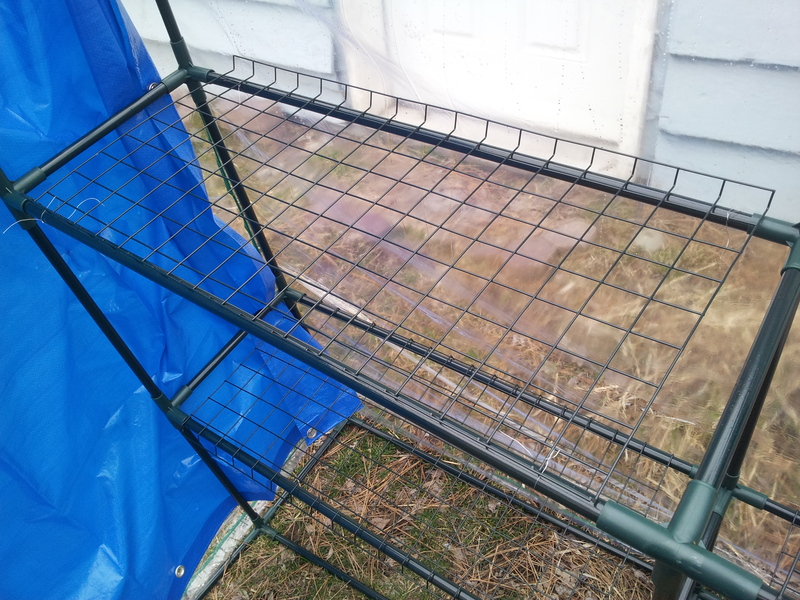 The shelves aren’t stable within the greenhouse because nothing is level. You can see that the seed tray can slip easily. I ended up flipping the shelves so that they curled up instead of down. I used wire to secure them to their frames. BTW, the orange blob outside the greenhouse is a rabbit. Here you can see that the top shelf has been flipped. The shelf below hasn’t been flipped. How well does it work? I bought a couple thermometers and installed one inside the greenhouse and the other dangling from one of the lines outside the greenhouse. During the day, the greenhouse is 6 to 8 degrees warmer. At night, even with the light on, the difference is about 4 degrees. I think I need to do more to hold in the radiant heat. I could probably put in some buckets or barrels of water to act as a heat sink. 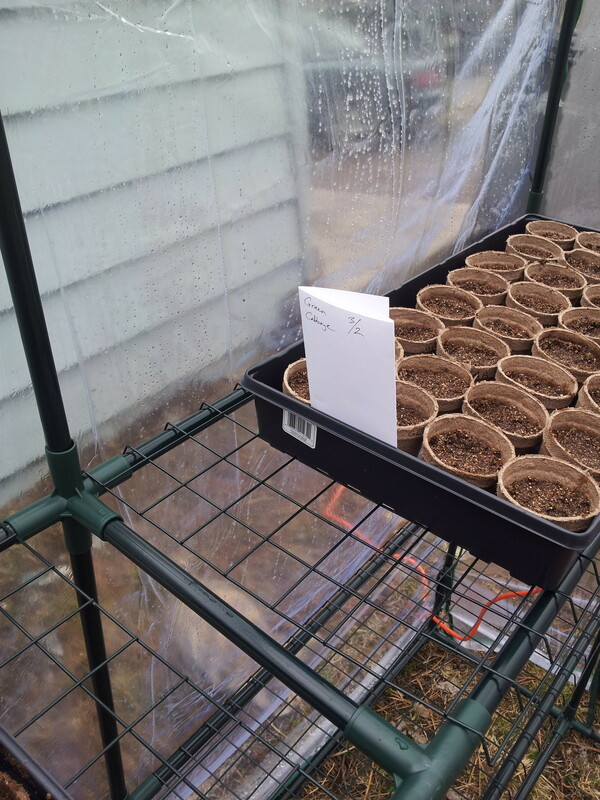 This entry was posted in Buildings/Structures and tagged biglots, greenhouse, radiant heat by admin. Bookmark the permalink.